It is with a heavy heart and through tears that I write this post. A dear friend, Karen Fowler, who was probably best known as “Harp” and “HarpNSoul” in the Taylor Hicks online community, has recently passed away. All of us who loved Karen are feeling devastated by this tragic loss. Many Taylor fans may have already heard or read the heartbreaking news about Karen, but they might not be able to put a “personality” with the name. I would like to share a little about Karen, so that those who didn’t know her can get to know her a little, and those who did know her can reminisce along with me. Karen was a loving wife, daughter, sister, aunt, mother and grandmother. She was also a wonderful friend — kind, caring, understanding and generous, with a unique sense of humor and a quick wit. She encouraged us, reassured us and advised us. She was always there when we needed her. Karen was a true confidante. I admit there were many times when I was complaining about the same old things to her, but she would still listen, try to make me feel better and give me advice if I needed it. Some of her favorite things included photography, shoes, Coach purses, American Idol, Deadliest Catch, FarmVille, Stephen King books, Dill Pickle Pringles, Mallomars, Shamrock Shakes, Cyndi Lauper, Cat Stevens, Queen and Freddie Mercury — and of course, Taylor Hicks. Karen took many pictures of Taylor that she shared with her fellow Taylor fans. I know how much she enjoyed sharing pictures she had taken of Taylor, because she was combining her love of Taylor with her love of photography. Karen also provided RHS with seven photos that she took of Taylor after the Rams Head show in this post from last February. Those are just some examples, to show not only Karen’s talent for photography, but her generosity in sharing her photos for all of Taylor’s fans to enjoy. Here are a few more of Karen’s Taylor photos (one, two, three) that I posted here in the past. I know that many people will enjoy viewing her photos for years to come. On Karen’s birthday last year, the blog post I made was in honor of her special day. In this post, I made a little joke about it being her 23rd birthday and then filled the post with pictures of Taylor playing harmonica (Taylor with his “harp” in honor of Harp), concluding the photo array with a particular favorite of Karen’s, Taylor using the harp brace. She was touched by the birthday post and the nice comments that people left for her. Here is the link to that post. It’s still touching to read all the birthday wishes that people left for Karen in the comments section of that post. Laurie (soulaz), who was also friends with Karen, wrote this poem about her friend. 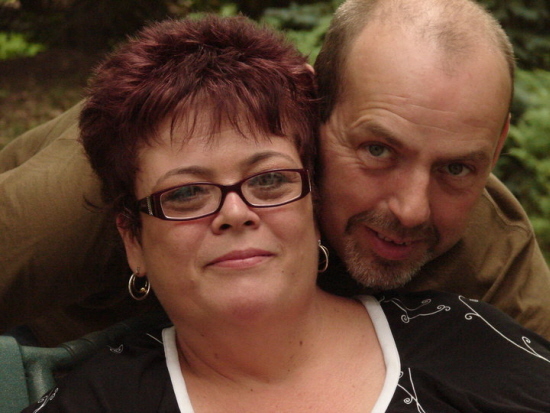 Here is a photo of Karen and her husband Ken, taken by Karen’s friend Linda T, on Karen and Ken’s anniversary in 2008. I would like to offer my deepest condolences to Karen’s family and all of her friends. She was taken from us too soon and we will miss her terribly. Even as we grieve, I think everyone who knew Karen will smile and laugh when they think about the times they spent with her, because she always brought “the fun” with her. Even when she wasn’t feeling well, she would still crack jokes and make others laugh. Of course she had her serious, pensive side, too. There were many facets to Karen’s personality. 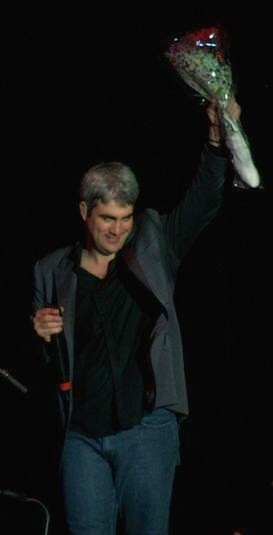 I know that Karen had a lot of friends in the Taylor Hicks fandom. I also know that many people felt like they knew her just from reading her posts online. We all feel a sense of loss, yet we’re also thankful that she was a part of our lives. So I invite everyone to share your memories and photos of Karen here in the comments section. Like others here, I do feel a special “kinship” to all of you. Just the very act of sitting here, writing on a comment on this blog, is bringing back so many memories . . . the overwhelming thought going through my head right now, is just how much fun I had with Karen, how many “laugh until the tears are flowing and the belly is aching” moments we shared. While my time spent with Karen was brief, in comparison to the span of a life, each moment that I had with her is a treasure that I will hold in my heart always. I am so thankful that I got to know her. She blessed my life with her warmth, her sharp wit, and her genuine friendship. To Karen’s family and closest circle of friends, I just say that my heart is breaking for you right now. I know what a loss like this feels like, and my prayer is that you will find peace and strength in your memories, and in each other. Karen, I will miss you so . . .
How wonderful to see all these again, and remember the joy Harp gave us with her fantastic photography. She will be missed. Over the time your blog was active, I smiled at the beauty of the photos, giggled at the hysterical and funny comments by readers, and even tossed in daily comments myself at the work by your “secret agent” Harp. My morning routine was to turn on the computer, make my coffee and hurry to your site to see what new goodies you and your buddy had waiting for your eager readers. 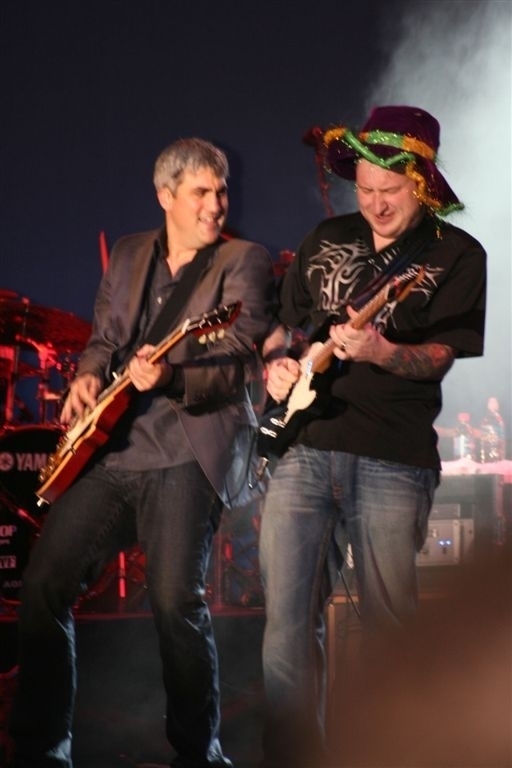 I’m sorry for the sad occasion that lead you to bring these gems out of the “attic” but I feel Harp is happy at the thought that her hobby (photography in general and Taylor Hicks as a subject) is still providing pleasure to the fans. Missed you presence on the internet Taysharmonica and thanks for the memories. I am grateful for having spent the time with so many caring, loving people, and miss you all. My sympathy goes out to all who knew such a special person. She will be remembered. What a sweet tribute for your friend. I didn’t know Karen personally but thoroughly enjoyed all the wonderful pictures she took and shared of Taylor. Miss seeing you around the net TsH. Adding my heartfelt sympathy to Karen’s husband and family, have enjoyed so many of her photographs of Tay in the past. Nice tribute to her here. Tays and soulaz, you both did a beautiful job paying tribute to our wonderful friend. I know the two of you had more of a history with Karen than I did, but I remember my time with the three of you as one of the highlights of my adventure within the fanbase. When you guys decided it was time to step away from the online world (which I completely understand, though I still miss you), Karen kept it touch with me. We tweeted, IMed or e-mailed just about every day. She became a part of my life. Since this unbelievable tragedy, I’ve learned just how many people she kept up with. And not in a superficial way- she asked about people’s lives, offered advice or comfort and was always ready with a witty remark. I don’t really know what to say. All I can do is shake my fist at God. What a wonderful tribute. Karen was one of the most wonderful people I have met on my Taylor journey and I am privileged to have had her in my life. She made me laugh, made me cry, made me laugh until I cried. 🙂 Some days she inspired my creativity, others my Taylor pev. 😉 I’ve said this to friends all week – my weeks will be filled with fewer smiles because she inspired so many. I sat here with tears and smiles all at the same time. I think you know, as do others that Karen and I spent some time together- and talked often. I will love and treasure each and every minute I had with her…tho it wasn’t long enough…. It’s so nice to see RHS back! I love your tribute to Karen-you did a beautiful job. It’s so great that you have saved all of these special memories so her friends can relive the good times. This is a beautiful tribute for such a wonderful girl…I also made this site my first stop in the morning and usually my last at night….its this last year that I’ve gotten to know Karen in real life…we spent a “ten hour” lunch last month at a great Mexican restaurant talking Taylor and life in general…I still can’t believe she’s gone from us, I was so looking forward to future marathon get togethers…its just unfair and leaves me so sad for her family and the lives that she touched, there were many. Karen was an amazing woman and wonderful, generous friend. Thank you for this moving tribute to her, her life and some of the important passions in her life. She has left a hole that will never fill. My prayers to her family. I have posted very little about my feelings for my friend Karen and her passing. I have to admit my anger kept me from voicing my thoughts except to a chosen few. I thought, how unfair it would be to surround my memories of Karen with such a destructive emotion guiding my words. With the help of a few friends, their tributes and their memories, I’ve come to release that anger. Coming back to Tays’ RHS to celebrate Karen brings things full circle for me. She is the one who introduced me to a site which drew some of the wittiest, most talented posters from all corners of the Taylor fandom. Tays and Soulaz, your words touched me. Thank you so very much. I never met Karen, but of course I recognized the name Harp. This is a wonderful tribute to her and I was moved to tears. Karen has been a lovely and generous online friend to me, sharing her wit, humor and photos. I will miss her, and am grateful to have these pictures and posts by which to remember her often. Thank you, TaysHarmonica. Karen was one of my first online and real life Taylor friends. We shared so much in the way of Taylor pictures, adventures, news, perv, concerts, and gossip. But my favorite memories of Karen are going to be the times when we got together for friendship outside of the Taylor world and the hours of laughter and tears. My best memories include these times: shortly after her mother died, when four of us took a car trip to Cape Cod for a long weekend and she finally was able to take a full breath; taking her to see the opening night of Taylor in Grease in NYC; hanging around New York City and creating havoc in the Disney Store trying on hats; sharing BBQs; sharing New Years Eve with her and Ken in 2008; and the hours of time on the telephone and late night IMing. She was a special person with a special gift of making you feel included in her world. Someone said to me the other day that perhaps God knew that Karen needed to rest – rest in peace then, my friend. Thank you for coming back with this wonderful tribute to a truely remarkable lady. I had the pleasure of talking to her here on your site, but really got to know “Karen” on twitter. Like others have stated we exchanged e-mails and become entwined in each others lives. We had both been experiencing health issues this year, but she always worried about others checking on me making sure I was alright, and me doing the same. There will be a void in Taylor’s fan base with her gone, she will not be soon forgotten. Thank you again. You know, I am really reeling from this, because it was so unexpected. K was an amazing person, and packed so much life and joy into every moment that it made it impossible to find pleasure in her company. I wish we could have really met face-to-face. I always make the mistake of thinking we have endless amounts of time, here on earth. Well, I do know that I will see my friend again, and like Tay says, I’ll get by…somehow. Taysharmonica, thank you for putting so much time and thought into writing this wonderful tribute to Karen. You captured the essence of a remarkable woman who I was lucky to call my friend. Soulaz, your poem made me cry yet again as I have so often this week after hearing the news. Reading the blog post and the comments so far make me realize how much Karen was loved. I remember and cherish so many things about Karen — her eye for photography, shown in all the links you posted above. She also took some of the most amazing pictures of Taylor at WorkPlay in September of 2009. Her care and concern for others spread to those not only in her family and closest friends, but to many across the country and even around the world. Being friends with Karen meant so much more than being just a “Taylor friend”. She was a great listener with a very keen intuition, and we often found ourselves talking late into the night about larger life issues. And of course as many people already know, her sense of humor was second to none. I don’t think I knew anyone who could make me laugh so hard I cried as often as Karen did. I will miss Karen more than words could ever express, and my heart and prayers are with her family. Thank you again for this wonderful tribute to her. I only “knew” Karen through this blog which I enjoyed so much. I loved Karen’s photos and seeing them again with this post. Tays, thank you for writing such a beautiful tribute to Karen and including all those wonderful photos she shared with the rest of Taylor’s loyal fans. soulaz, as usual, you wrote beautiful, touching things about this wonderful lady. To Karen’s family, I can only express my deepest condolences on the loss of a wonderful lady who was loved by so many. So sorry to hear about the passing of “Harp”/”HarpNSoul”. I did not know her except by her online names but I do remember reading her posts and enjoying her pictures. She looked to be very young which makes this news even more tragic. My condolences and prayers go out to her family and friends. Thank you for sending the email to those of us who were touched by her and for the pictures and posts. God bless you and also Karen and those who loved her. It’s been a week since we all heard the awful news. I raised a glass and toasted my friend today. on May 4, 2010 at 7:38 am | Reply J.
I am a close family friend of Karen (Harp’s) family and I want to say she was a wonderful, talented,just plain fun to be around woman and heaven gained a fantastic angel on April 26th,2010. It’s almost two years without my Sister Karen. I am Jennifer Karen’s baby Sister and I remember so well all the funny witty things she would tell me or show me either on twitter, the Taylor boards, via text! I just want you guys to know she loved spending time with you all and Taylor my Sissy was your biggest fan! It still hurts so much that she’s not with us but, I know we have an angel looking after us. I am deeply touched by the out pour of how everyone remembered her life. My Sister was very bright but, very witty….. I remember going to the Starland Ballroom to see Taylor with my Sister and she was clicking away with her camera! She had taken so many photos of Taylor and every single one of them she captured the moment! As she took photos of Taylor she was busy taking photos of her Grandchildren and my two girls! I am happy to have these memories. She once old me you’ll be very happy to have these photos someday. As a family we struggle with her passing still till this day. I hope your all doing well, I can’t wait to show my Sister Dawn this beautiful tribute to our beautiful Sister Karen. My Sister Dawn and I Thank each and everyone of you! I won’t forget you “Soul Patrol” ladies!! Whoo!!! Thanks for checking in and sharing your memories of Karen! I was just looking at some family photos of people I hadn’t had a connection with for more than 40 years. Karen was right — you do appreciate looking at the past through the camera’s lens. Everyone looks “just like you remember them” and that is wonderful.